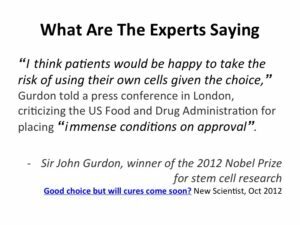 Recently published patient advocate and ethic expert perspectives ((Wilkinson, S. Lack of Proven Efficacy: A Legitimate Reason to Deny Access to Cellular Therapies or a Barrier to Innovative Trials and the Development of Cures? http://www.cellr4.org/article/403)) , ((Hooper, C. Are Excessive Regulations Prohibiting Doctors from Trying to Cure Patients? http://www.cellr4.org/article/401)) , (( Hanson, B. 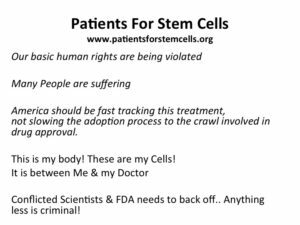 Why Clinics that Use Adult Stem Cells Administered by Physicians Represent a Threat to Industry. http://www.cellr4.org/article/395)) , ((Zigler, J. When “No Option” Is Not an Acceptable Option. http://www.cellr4.org/article/390)) , ((Goodman, KV. Getting it Goldilocks Just Right: Science, Regulation and Ethics. 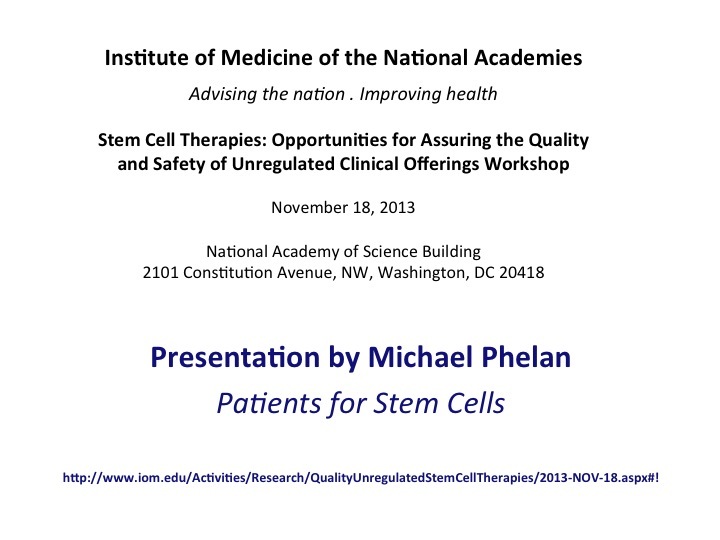 http://www.cellr4.org/article/387)), prompted me to share with this perspective article my recent presentation at the workshop of the Institute of Medicine of the National Academies: Stem Cell Therapies - Opportunities for Assuring the Quality and Safety of Unregulated Clinical Offerings, that was held on November 18, 2013 at the National Academy of Science Building in Washington, DC. I believe it is an important effort to promote sharing of different perspectives, in the hope to catalyze a constructive debate and more importantly to assist in the development of practical solutions ((Ricordi C. Towards a constructive debate and collaborative efforts to resolve current challenges in the delivery of novel cell based therapeutic strategies. http://www.cellr4.org/article/110)). I would like to be a voice for patients and make a case that future promising ESC & IPSC and manufactured cell based products are not confused with Autologous Stem Cell treatments that should be available now in this country as a doctor-patient interaction, without any additional regulation than what is already required for the practice of medicine and the safe operation of laboratories. 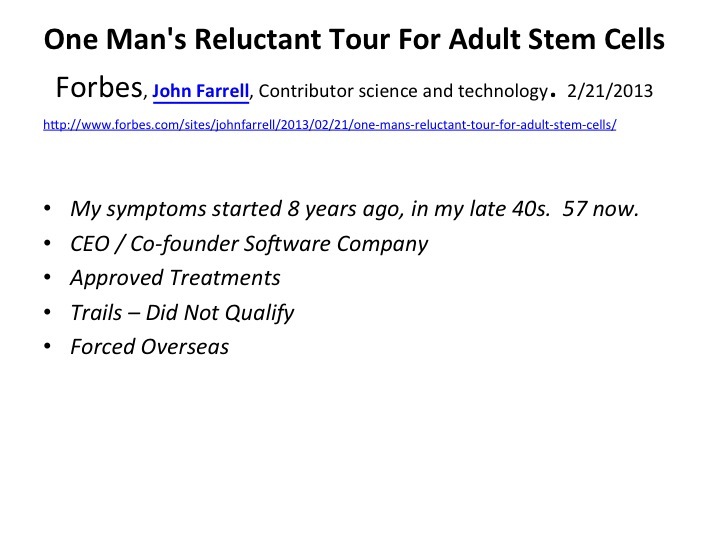 In February I was interviewed by Forbes magazine, which they titled One Man’s Reluctant Tour for Adult Stem Cells. 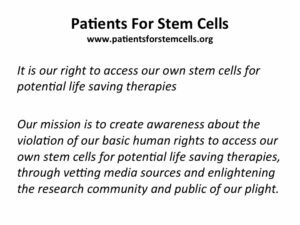 The interviewer had recently interviewed a so-called Stem Call expert, who spread misinformation by falsely attributing the dangers associated with Embryonic Stem Cells, and Induced Pluripotent Stems Cell treatment with Adult Stem Cell treatments. I agreed to be interviewed to correct the misinformation. I’m an entrepreneur. I’ve started and grown successful computer companies and served as CEO and President. In 2006 I co-founded a company called SevOne, which became one of the fastest growing technology companies in the world. I recently stepped down. MS played a big part in my decision. When I was starting the company in 2006, I started getting horrendous stabbing pains in my neck. At first it was diagnosed as Lyme disease. Everyone other person in my neighborhood had Lyme disease. Three or Four had Bells Palsy from Lyme disease. I think I wanted it to be Lyme disease. However the diagnosis of MS was confirmed within a year. As I was building my company, I focused on getting the best care available. My symptoms started 7 years ago, in my late 40s. I’m 57 now. I have had the best Neurologists in Philadelphia, first at the University of Pennsylvania, and now Jefferson. I’ve been on standard FDA approved drug therapy for over 6 years. Unfortunately, these therapies have not been very effective for me. 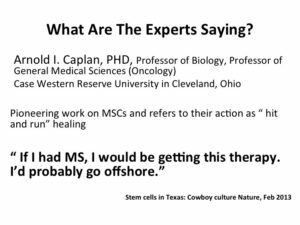 The bottom line is that there is no cure for MS. None of the approved treatment stops the disease. Efficacy is measured in how a treatment slows down the disease process. All of the standard treatments are only 34% or less effective, except TYSABRI, which has a higher risk profile. So, I started researching promising trails. 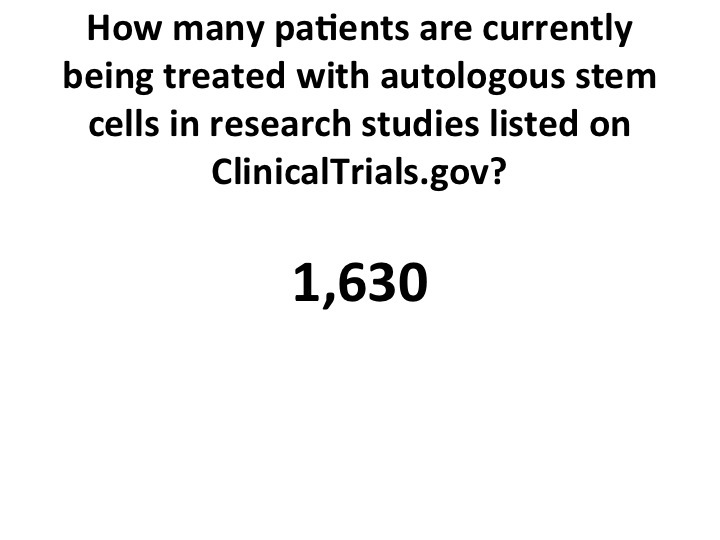 I found that the study results of autologous stem cell treatment were impressive. They were careful not to call it a cure. But many subject patients were using the word cure. The only way to get this treatment in the US is in an approved FDA study. So, I tried to get into the clinical trials here in the U.S. 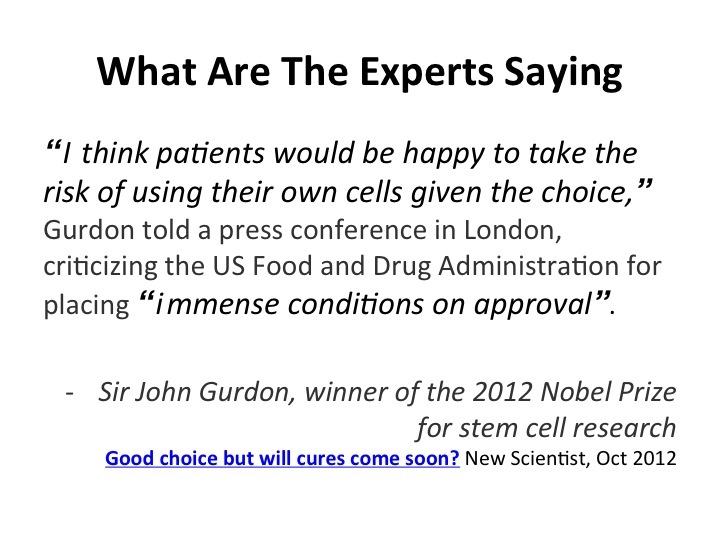 The first: “Stem Cell Therapy for Patients With MS” headed by Dr. Richard Burt, at Northwestern University in Chicago. This treatment Involves taking bone marrow derived stem cells, separating the cells in the lab and giving them back to the patient. Their treatment also involves using chemotherapy to suppress the immune system, then rebooting the patient’s immune system with their stem cells. 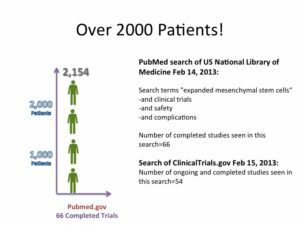 The clinical trail process was not funded by a pharmaceutical. There was no repeat business in harvesting an individual’s cells. So I paid approximately $10,000 for travel to Chicago, for tests, and hospital charges including an MRI. It turned out that I didn’t qualify for this trail. Dr. Burt’s opinion was that the risk related to aggressive chemotherapy was not worth the potential gain, because I was in my 50s, and the MRI evidence did not confirm enough recent disease activity. Apparently, the best results were obtained when the disease is in the active, early stages. My stage was questionable. It certainly felt active to me. 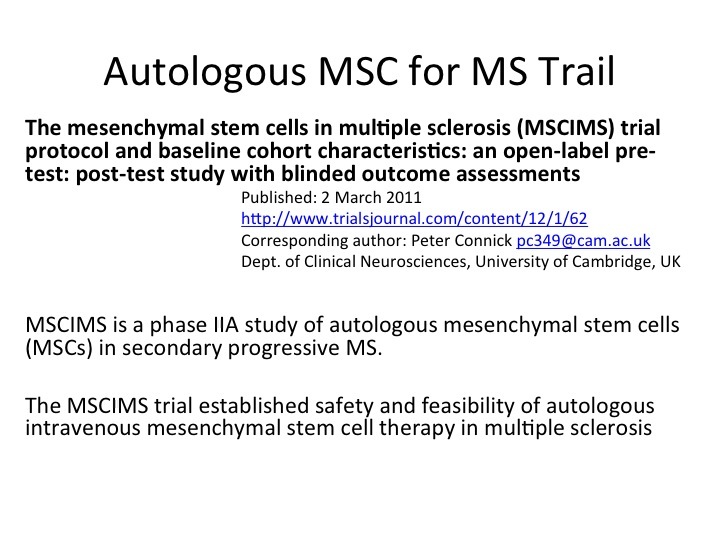 I tried to get into a second US clinical trial: “Autologous Mesenchymal Stem Cell (MSC) Transplantation in MS” headed up by Jeffrey Cohen, MD, at the Cleveland Clinic, but I didn’t qualify for this trail either, because I was over 55. 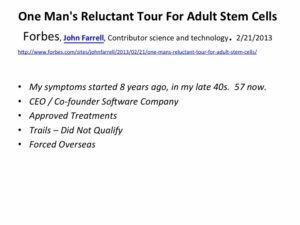 So I went to The Stem Cell Institute in Panama and had a very similar treatment to the Cleveland Clinic Study, except they extracted my stem cells from my fat instead of bone marrow. 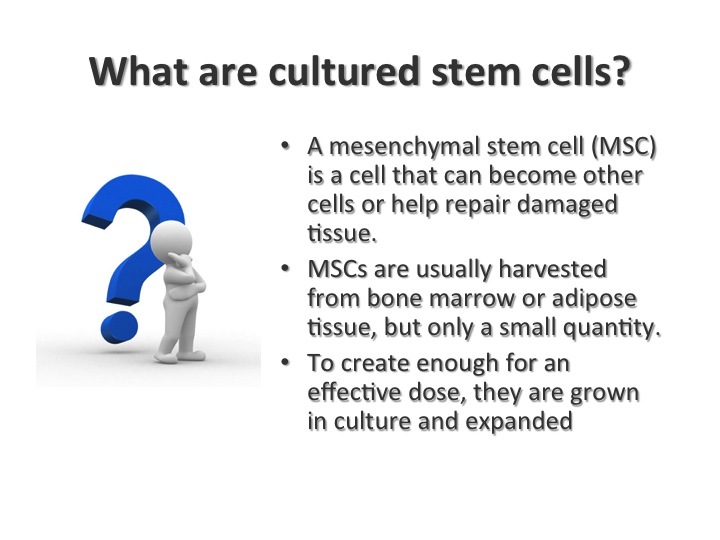 I chose the Stem Cell Institute because they published their research in Translational Medicine. 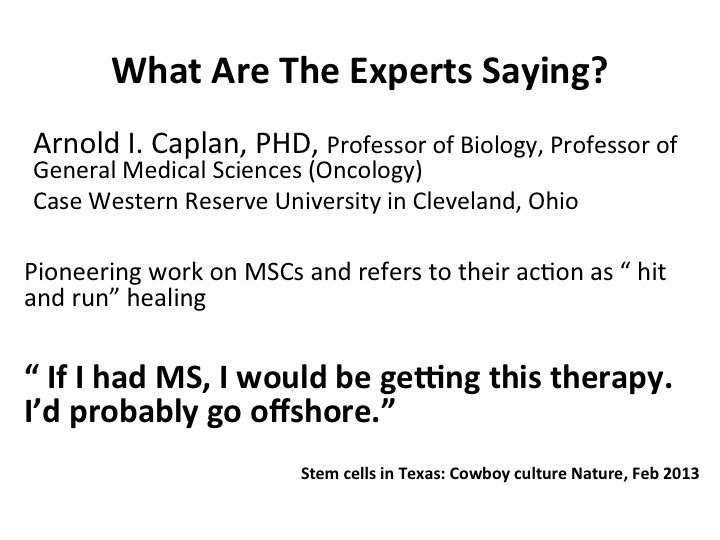 In addition, I corresponded with physicians and researchers experienced in Autologous Stem Cell treatments, including Roger Nocera, author of Healing Cells – Cells that heal us from cradle to grave, and I also listened to Arnold Caplan of Case Western. I had visual problems for over a year before treatment, including double vision. After my first treatment in May of 2012, my vision problems resolved and I was able to continue driving. My mental and physical energy improved dramatically. A number of other problems improved. So, I was pleased with the outcome. Their research and progress holds tremendous promise to patients in the future. On behalf of all patients, I would like to recognize and thank them for their good work. However, there is also financial motive or discoveries wouldn’t be patented. This is not a bad thing. As an entrepreneur, I certainly understand that profits are necessary. You can do good and do well at the same time. But there is a potential conflict. 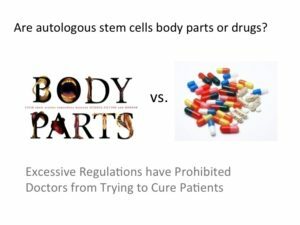 If your patents involve ESC or IPSCs, you can’t voice opinions on Autologous Stem Cell treatments without disclosing the conflict. 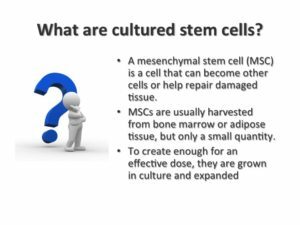 Not necessarily today speakers, but some conflicted scientists have claimed that cultured stem cells are potentially dangerous. What data exists showing safety? 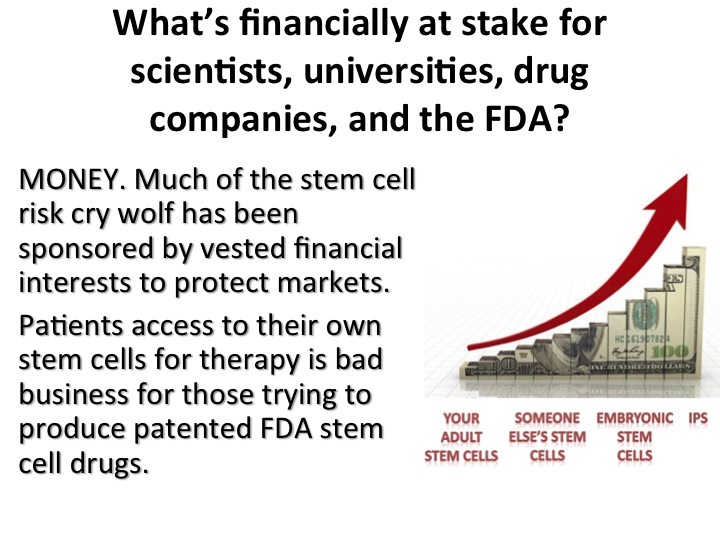 What’s financially at stake for scientists, universities, drug companies, and the FDA? Those crying wolf in the press, spreading misinformation have been generally conflicted. They’ve either been sponsored by vested financial interest to protect markets, or their research involves patents that could be threatened, or they receive substantial funding for developing new molecules rather than using cells. There is not a big market in using our own cells, autologous cells. 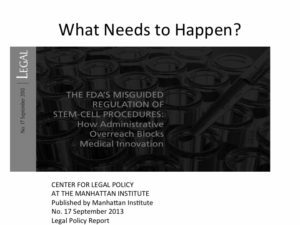 One of the FDAs arguments in a current court case, is that Autologous Stem Cell treatment would depress the market for pharmaceutical companies products that have required expensive studies. 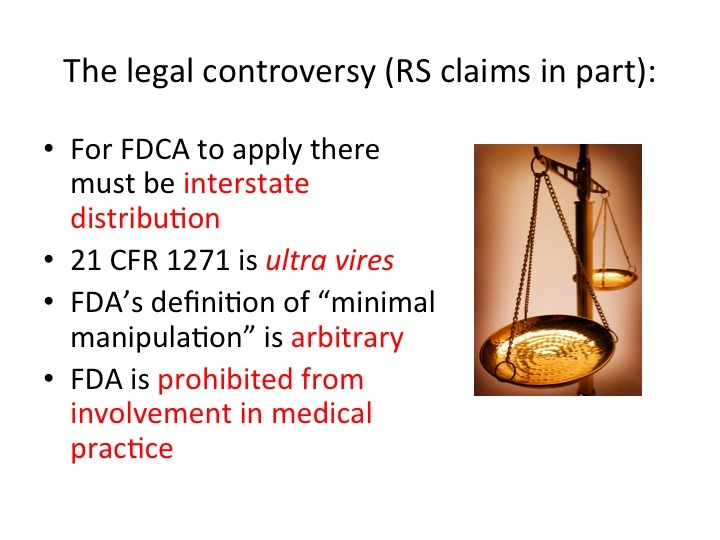 Apparently in this case the FDA sees its role as protecting markets over patients. So, if financially conflicted parties are generating the media surrounding the hypothetical risks, what’s the real risk? 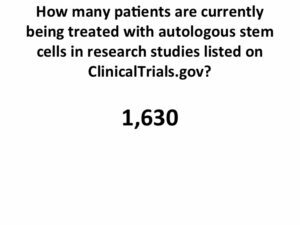 In the U.S. national library of medicine or published FDA trials, how many patients have been treated with expanded MSCs without serious complications? 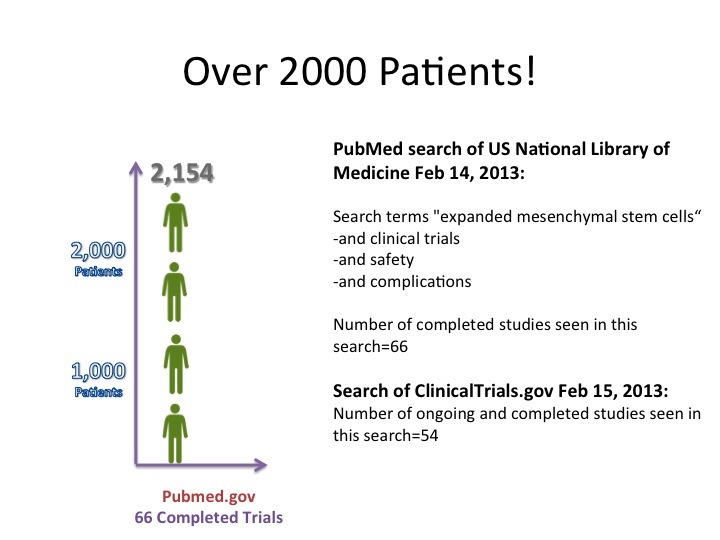 Over 2000 patients without complications in 66 completed trials. How many is enough? How many drugs have been approved or fast tracked with significantly less evidence? This is public information available to patients and doctors. This is what I shared with my doctors to make the decision to go to Panama. 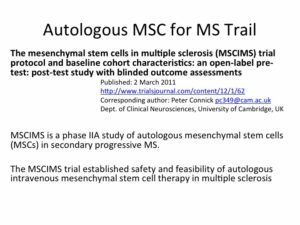 Based on this evidence, it was clear that treatment with autologous expanded MSCs was safe – safer than some of the approved treatments. 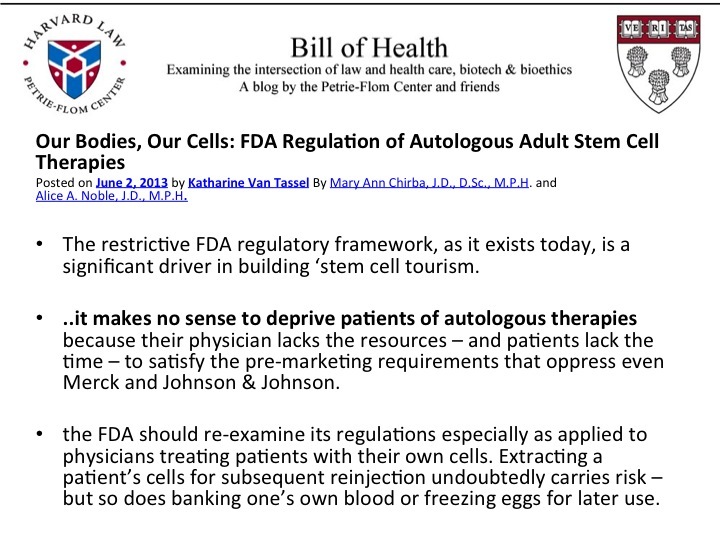 Recently in the Harvard Law Bill of Health Blog an article titled, Our Bodies, Our Cells: FDA Regulation of Autologous Adult Stem Cell Therapies (Posted on June 2, 2013 by Katharine Van Tassel By Mary Ann Chirba, J.D., D.Sc., M.P.H. and Alice A. Noble, J.D., M.P.H.) 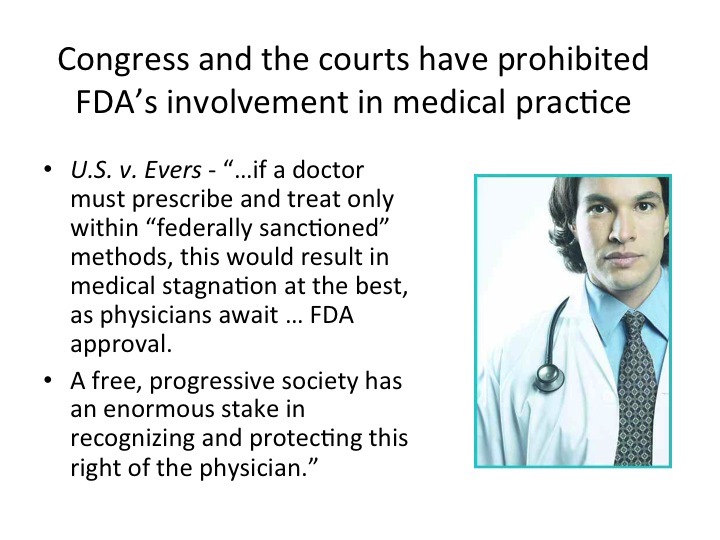 said: “it makes no sense to deprive patients of autologous therapies because their physician lacks the resources – and patients lack the time – to satisfy the pre-marketing requirements that oppress even Merck and Johnson & Johnson. 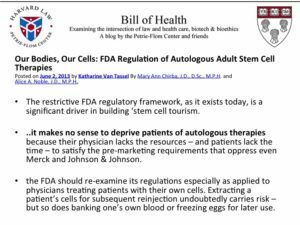 The FDA should re-examine its regulations especially as applied to physicians treating patients with their own cells. Extracting a patient’s cells for subsequent reinjection undoubtedly carries risk – but so does banking one’s own blood or freezing eggs for later us”. Dr. Chris Centeno has pioneered this advanced treatment in his Orthopedic Practice: they harvest MSCs from the patient, concentrate and expand the cells and then re-injects them back into the patients damaged joints. 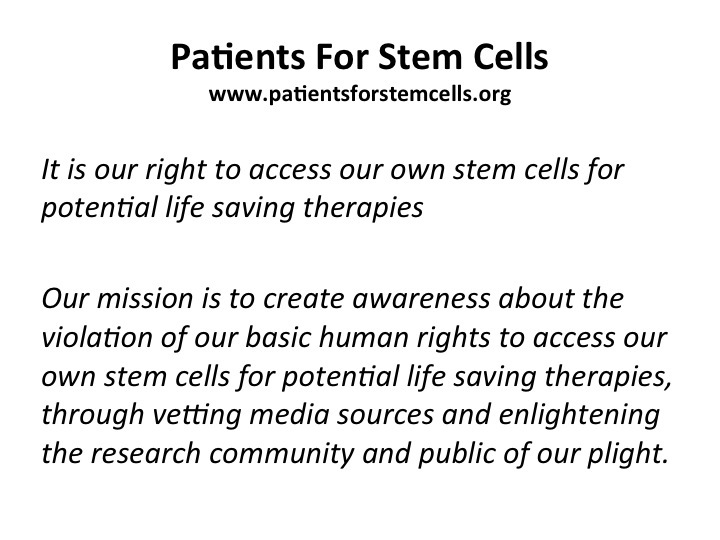 Over 500 patients have been treated with their own stem cells at his clinic. The results have been striking: 2/3 reported better than 50% relief; 40% reported more than 75% relief. 2 years after treatment; only 8% opted for knee replacement surgery. Now Dr. Centeno is in the middle of a Landmark legal case that will shape our medical future. 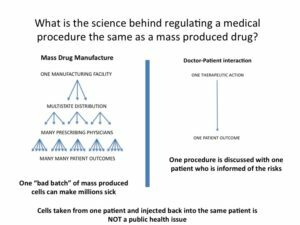 What is the science behind regulating a medical procedure the same as a mass produced drug? 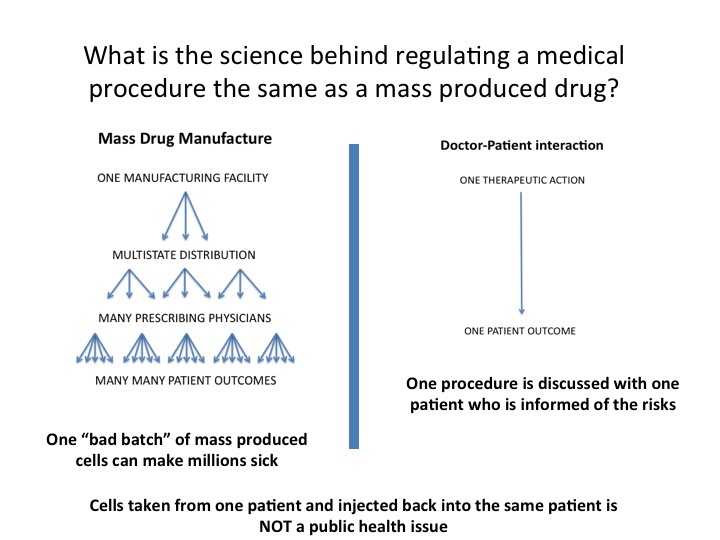 Cells taken from one patient and injected back into the same patient is NOT a public health issue. 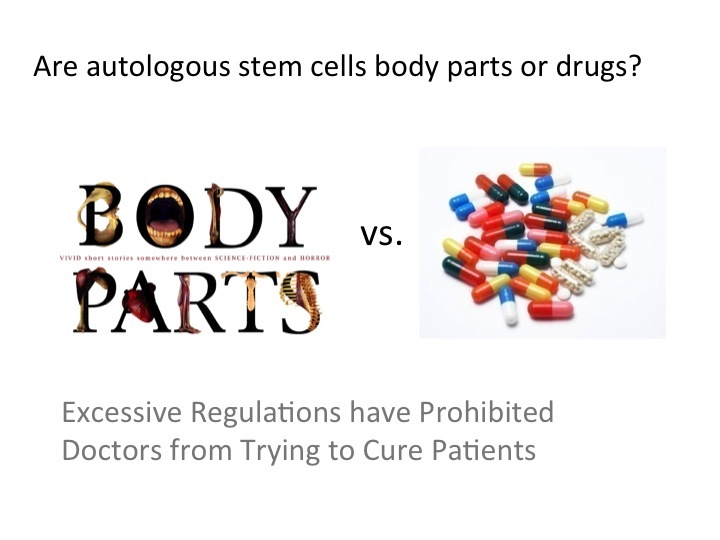 Autologous therapies do not represent a public health risk in the same sense as a mass-produced drug, but rather, represent a risk more akin to a surgery than a drug. It is neither cost-effective nor feasible to expect the same manufacturing quality controls for autologous therapies as those in place for mass-produced allogeneic therapies (just as one would not expect the same quality control burden in an operating room as in a device manufacturer’s clean room). The risks associated with the delivery of adult, autologous cells (i.e., cancer, cell aggregation-induced embolism or stroke, ectopic tissue formation, disease transmission), while not zero, is exceptionally low in practice and largely theoretical at this point. With the exception of maintaining sterility, the risks associated with short-term expansion (through p5) are relatively low and can be managed effectively through the use of closed loop systems or modest QA programs. While efficacy may vary with cell purity or dosing, there is little risk from a safety perspective in delivering a mixed population of autologous cell types across a wide range of dosages. Similarly, there does not appear to be a safety issue associated with cell-viability. Surgeons transplant hearts and other body parts; – regulated as “medical procedures”. 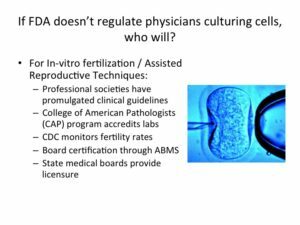 In Vitro Fertilization (IVF) involves using sperm cells from one person, egg cells from another person and manipulation in a lab to create a third person – regulated as a “medical procedure.” Taking MY cells, manipulating them (expanding to therapeutic dose), injecting them back into MY body – the FDA wants to regulate as a “drug”? It makes no sense! 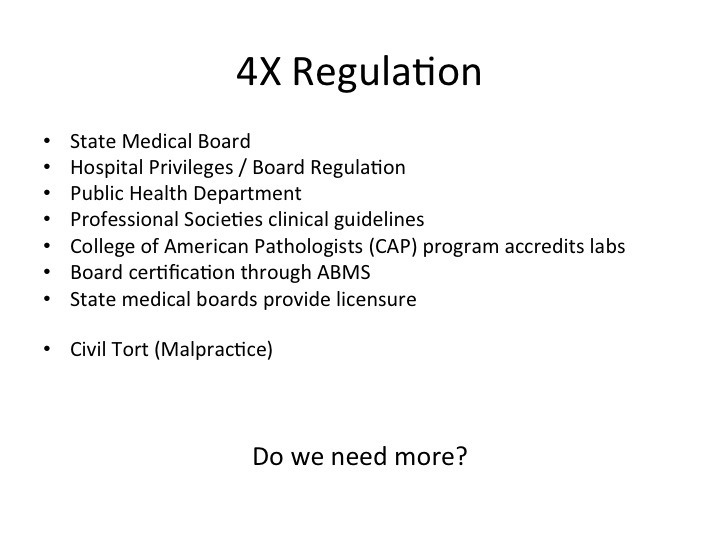 Emerging ESC & IPSC treatments are something new and will require specific regulatory solutions. 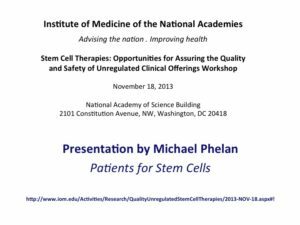 Hopefully todays’ workshop will help define these Autologous Stem Cell treatments as not something new. 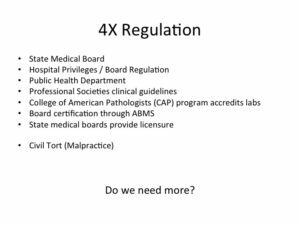 It is the practice of medicine – an interaction between one doctor and one patient, with multiple layers of regulation for the practice of medicine, including State Medical Boards, Hospital Privileges/Board Regulation and The Public Health Dept. 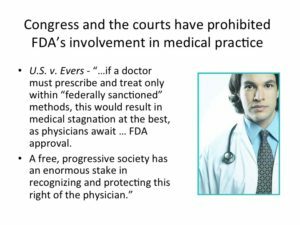 More regulation will not stop charlatans or incompetent physicians from malpractice or malfeasance. That is why we have a civil tort system. 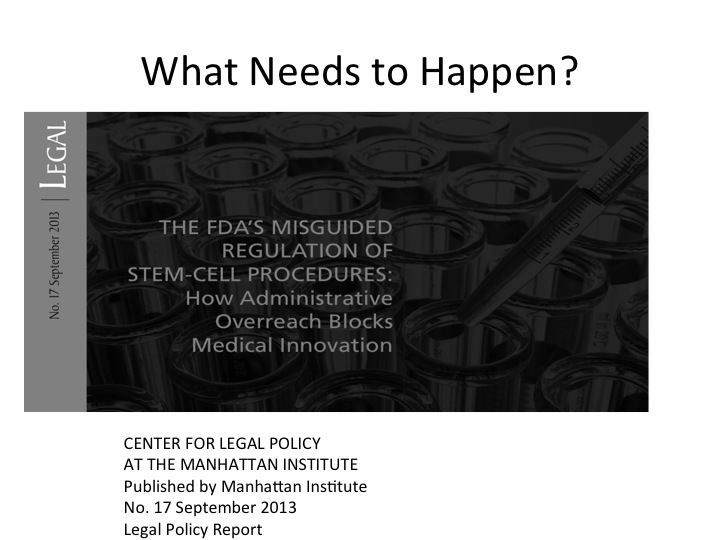 Mass produced cell products need new regulation, Autologous Cell Treatments do not.